Artist’s impression illustrating the formation process of massive stars. At the end of the formation process, the surrounding accretion disk disappears, revealing the surface of the young star. At this phase the young massive star is much larger than when it has reached a stable equilibrium. Massive stars generally start out life much bigger than they will be in maturity, a new study seems to confirm. Astronomers from the University of Amsterdam got a rare look at a massive star in the process of forming and found that the star will contract until it has reached a stable equilibrium. The researchers studied the young star B275, which lies in the Omega Nebula, also called the Swan Nebula or Messier 17. This hotbed of gas, dust and young stars lies approximately 5,500 light-years from Earth, in the direction of the Sagittarius constellation. Astronomers typically struggle to obtain clear observations of a massive star as it is forming, since newborn stars are deeply embedded and obscured in their parent clouds of gas and dust. To lift the veil on the process of star formation, the researchers sifted through ultraviolet and infrared data collected from a powerful spectrograph instrument, called the X-shooter, on the European Space Agency's Very Large Telescope at the Paranal Observatory in Chile. Ochsendorf analyzed the data as part of his master's research project at the University of Amsterdam. The first released VST image shows the spectacular star-forming region Messier 17, also known as the Omega Nebula or the Swan Nebula, as it has never been seen before. This vast region of gas, dust and hot young stars lies in the heart of the Milky Way in the constellation of Sagittarius (The Archer). The team's findings appear to confirm a theory of star formation predicting that a newly formed massive star will contract until it reaches a more stable state. As they form, young massive stars are surrounded by rotating gaseous disks that feed material to the newborn giants. This complicated accretion process has been poorly understood. When the process is complete, the surrounding disk disappears and the budding new star becomes visible. This is the stage B275 has entered, the astronomers said. 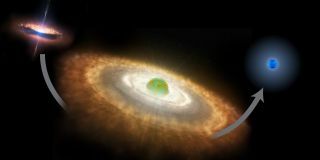 The core temperature of B275 is now high enough for the star to begin burning hydrogen, but the star will contract until it reaches a stable equilibrium, in which the energy production in the core exactly balances out the radiation loss at the stellar surface, the researchers explained. Observations from the Very Large Telescope also showed that the surface temperature of B275 was significantly lower than usual for a star its size that is 1,600 times more luminous than the sun, the astronomers said. To account for this discrepancy, the researchers assigned a larger radius to the newborn star which matches the sharp spectral observations taken of B275 that show it is a stellar giant, they said. "This is a beautiful confirmation of new theoretical models describing the formation process of massive stars, obtained thanks to the extreme sensitivity of X-shooter," said University of Amsterdam astronomy professor Lex Kaper, who is Ochsendorf’s supervisor. The results of the study were published in the Dec. 2 issue of the journal Astronomy & Astrophysics.